If you were at the Henry Clay Book Club meeting yesterday, then you'd understand how much of an enthusiastic fool I made of myself. If not, let me try to describe the type of insane excitement I had yesterday when we had over FIFTY people show up to our first meeting! 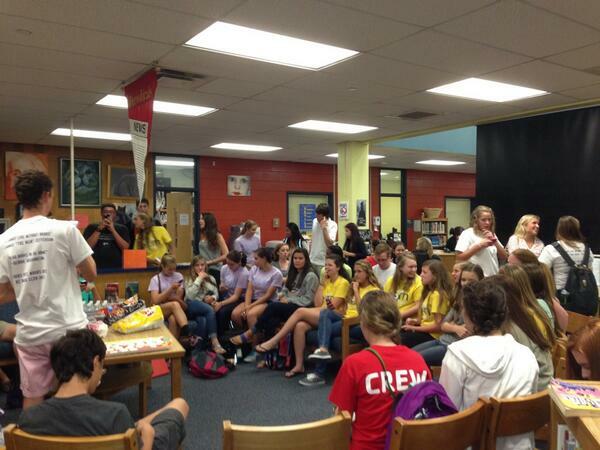 A lot of these pictures I'm posting are ones that people tweeted in to our HC Book Club Twitter account. There's my arm on the far right! As I write this, I am absolutely exhausted. I never knew when I agreed to be president that I would be spending this much time obsessing over every detail but I am more than ecstatic to do it. When you spend all your time doing something that you're in love with, it never seems like a chore! Anyways, the last week I feel like I've lived and breathed book club. Ordering shirts that had finally come in was super cool, especially when I got to hand them out to everyone and feel like Santa. And then there's the baking part, of course (I spent over four hours baking the other night. Super worth it, though)! Sadly, I don't have any pictures of the baked goods...they were all gone so quickly! Remember when I wrote in May about our last book club meeting and about how I loved brownies for big groups? I most definitely stand by that theory. Seriously, take your favorite prepared brownie batter and add anything. It's super easy to have a mixing bowl and three pans sized 9x13, and crank those things out. For the first batch, I made them double chocolate by pouring half a bag of semi-sweet chocolate chips into the mix. Super chocolaty brownies? Check, check. For the next one, I used 16 regular-sized Reese's cups and was super pleased with how they turned out. Use a cutting board and a butcher's knife to cut them into tiny pieces and then mix them into batter. They'll be mushy, but it almost works that better to incorporate all of the chocolate-peanut butter goodness. The add-in I've always wanted to try was York peppermint patties. I bought a bag and followed the same directions for cutting them into little pieces. What's different about this one is that I poured half of the batter into the pan, put the patties on top, then poured the rest of batter back on. These turned out really mushy and I think it may have been better to mix them into the batter before pouring it out, but they were still absolutely fantastic. I also made one of my favorite recipes, Strawberry Cake Cookies. So simple yet so good! Food's become a big part of book club (as it should be), but of course, it's all about the books. We're reading Holding On To Zoe by George Ella Lyon and our next meeting is September 25th...if you go to our school, show up! If not, read along with us and let me know what you think! You can trust that there'll be a blog post following that meeting if you want to keep up! Seriously, I really think this could be a fun blog thing to do, I'm pretty pumped! So guys, I LOVE BOOKS. And I'm very enthusiastic about it. Ask me about it!